This was another appetizer that I brought to the 60th anniversary party. I never get a chance to cook unhealthy things, so I figured I was going to go all out and not care about calories/fat content for once. I definitely would not recommend sitting down and eat more than 3 of these, but its great for a party for everyone to have one or two, as I always say everything in moderation. I hope you enjoy these tasty little suckers! 1.) While potatoes are boiling, fry up the bacon in a skillet. Cook the bacon well, after it cools it should crispy! 2.) Chop the bacon into small pieces and set aside. 3.) When the potatoes are cooked, drain all the water out. 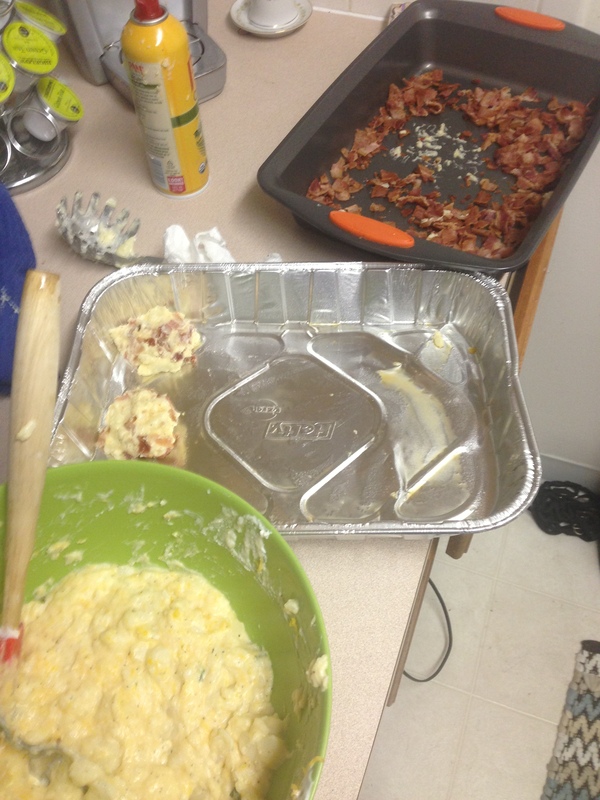 Begin mashing with a hand masher and add the sour cream, ricotta cheese, butter, salt, pepper and bacon fat. Let cool for 15 minutes, and then add the cheese and fold it in with a spatula. 4.) 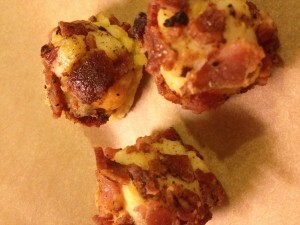 Using a spoon or a small ice cream scoop, scoop the mashed potato mixture into balls and roll in the crumbled bacon. Place on a cookie sheet and Bake for 12 minutes at 350 degrees, serve immediately. Oh boyeee! Going to a Halloween party tomorrow. Should be a big hit with the kids And Adults! I’m a dressing as Barbie the Bumble Bee! How Many servings does this recipe make? Sounds fabulous but need to serve 20 people! Thanks so much!!! Christina -I’m so sorry for the late response (you were sent to spam) -this recipe makes 24 small bites.